The painting “Madame Matisse” was painted by the artist in 1907. Here he depicted his wife – Madame Matisse. It must be said that when the canvas was presented for public viewing, the society embraced an indescribable feeling, and it was not a feeling of admiration. People could not understand how it was possible to portray such a close person with such an ugly light. Yes, and modern admirer of the artist’s talent do not find special beauty in this image. However, if you look at the picture in more detail, you can understand how ingenious was its creator. With large, bold strokes, the artist reflected something more important than just a beautiful portrait of his wife. Matisse was distinguished by the fact that he always wrote “soul”, that is, he wrote what he felt, how he understood, how he saw himself. Perhaps his vision did not always meet the usual criteria, but from this it was no less, but rather, more profound. The artist enjoyed the play of colors. 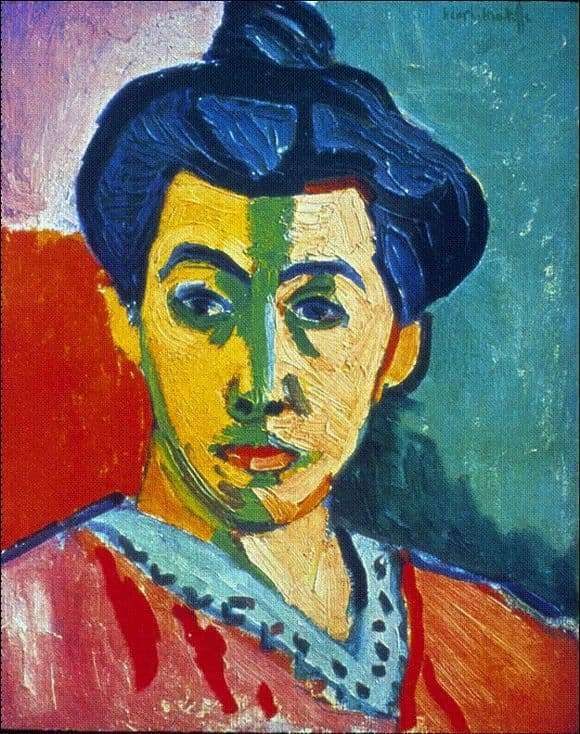 Some critics argue that such a color solution is quite bold even for Matisse’s canvases, but it is this saturation of the color gamut, a combination of seemingly incompatible tones, made it possible for the artist to display the true character of this woman. The picture is another name – “Green Line”. This line runs along the center of the face and the center of the whole picture, highlighting a strict, straight nose. The green color goes under the eyes of a shadow and delineates the oval of the face, as if separating it from the background colors. The eyes themselves are not as expressive as the bright and confident line of eyebrows, which gives a rather secretive and imperious character to their owner. Black hair color screams categorical and decisive, and blue highlights only enhance these qualities. The background of the portrait is made with larger strokes and divides the whole space into three different color planes. Here and bright, red color of passion, and cold lilac tone and peaceful green pastel. For Matisse, this is not just a random set of colors, this is a range of feelings that his spouse possessed.